Here’s a look at the 13 most important players in the proposed Commission (aside from Juncker and Mogherini, of course). One of Juncker’s most surprising announcements was that the Dutch foreign minister will become the first vice president of the Commission, with a wide-ranging brief to oversee ‘subsidiarity,’ to attend to the Charter of Human Rights and to eliminate waste within the EU institutions. He’ll also have the ability to veto any new EU initiatives within the Commission. In many ways, he’ll act like the Commission’s prime minister to Juncker’s president. It’s a great win for Dutch prime minister Mark Rutte, even though Timmermans comes from his junior governing partner, the center-left Partij van de Arbeid (PvdA, Labour Party). 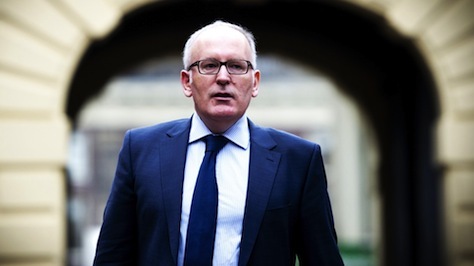 Timmermans has been a capable diplomat in Amsterdam, most especially in the aftermath of Malaysia Airlines flight 17, which was shot down over eastern Ukraine, killing 193 Dutch nationals. Prior to his current role, he served as state secretary for European affairs under former prime minister Jan Pieter Balkenende from 2007 to 2010. 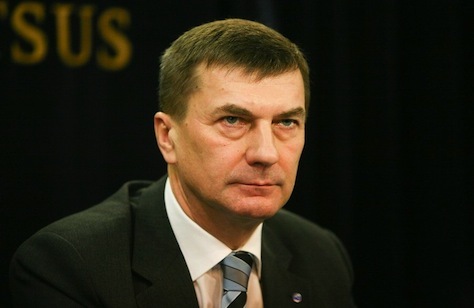 Ansip, until March 2014, was the European Union’s longest serving prime minister, and he stepped down after nine years in office for the express purpose of taking a job in Brussels. At the time, the idea was to exchange jobs with Estonia’s one-time central bank president and former European commissioner Siim Kallas. A scandal interfered, and the 34-year old social affairs minister, Taavi Rõivas, succeeded Ansip instead, and he will lead Estonia’s center-right Eesti Reformierakond (Estonian Reform Party) into March 2015 elections largely on the strength of Ansip’s record as a budget-cutting reformer who brought Estonia’s finances in line to enter the eurozone. As vice president for the ‘digital single market,’ Ansip will turn to some of the most novel issues of EU policy, including net neutrality, though it’s not entirely clear where his responsibilities end and where the responsibilities of Günther Oettinger, commissioner for digital economy and society, begin. Photo credit to Priit Simson / Delfi. Bratušek, a center-left liberal who has served as Slovenia’s prime minister since March 2013, lost the July parliamentary elections to leftist law professor Miro Cerar, a political neophyte. She had resigned the premiership after Zoran Janković, the mayor of Ljubljana, Slovenia’s capital, and the founder of her Bratušek’s party, Pozitivna Slovenija (PS, Positive Slovenia), tried to oust her from the leadership. Bratušek ultimately had the last laugh when her own newly formed liberal party, Zavezništvo Alenke Bratušek (ZaAB, the Alenka Bratušek Alliance) outpolled Positive Slovenia in July’s elections. The bad news is that while Positive Slovenia won no seats, Bratušek’s party won just four. That makes her new job in Brussels a soft landing for a politician who was always more at ease making policy than politics. She’s credited with avoiding a bailout since taking office in 2013. As the vice president in charge of energy, Bratušek could become an important voice in what might be choppy discussion with Russia over its current natural gas pipeline through Ukraine and its proposed South Stream pipeline that would go through Serbia and several other former Yugoslav states. Photo credit to Reuters/Srdjan Zivulovic. Dombrovskis was arguably at the height of his popularity when he resigned as Latvia’s prime minister last year when a supermarket roof in the capital of Riga collapsed and killed 54 people. 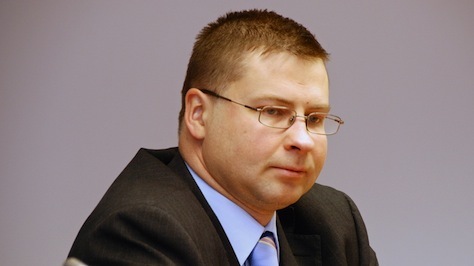 At the time, Dombrovskis was the darling of the austerity proponents across Europe, having forced severe budget adjustments to Latvia’s finances to keep it from becoming the target of bond price disruption. In January, Latvia became the latest member of the eurozone. While Dombrovskis will not be leading his center-right Vienotība (Unity) into national elections on October 4, he’ll instead become a ‘super commissioner’ with the power to direct monetary policy. If you’re taking bets on which of the many commissioners and vice presidents will become the loudest and most respected voice on the eurozone for the next five years, the early money will certainly be on Dombrovskis, who was frequently mentioned as an alternative to Donald Tusk as the next European Council president. European leaders, including German chancellor Angela Merkel, greatly respect him. 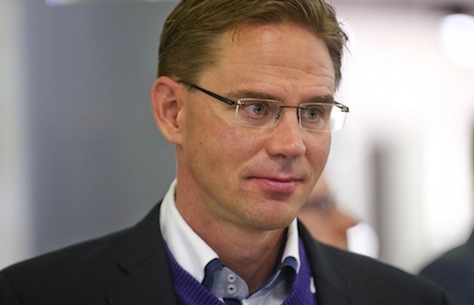 Katainen also left the premiership with high hopes of office in Brussels. Stepping down three months ago as Finland’s prime minister after just one term in office, Katainen was a dark-horse candidate for Commission president — or possibly the European Council presidency. A member of the center-right Kansallinen Kokoomus (National Coalition Party), Katainen steered Finland through the worst of the eurozone crisis. He’ll leave Finland in the hands of his hawkish former European affairs minister Alexander Stubb, who will campaign for a term in his own right in Finland’s upcoming April 2015 elections. He’s currently filling out the rest of the current Commission’s term for Olli Rehn, Finland’s influential former commissioner for economic and monetary union, who left the Commission to take a seat in the European parliament. His new role as super-commissioner is opaque, and he’ll share some of the economic spotlight with Dombrovskis and he’ll likely be supervising Pierre Moscovici, the new commission for economic and financial affairs. That Juncker gave the ‘jobs, growth and investment’ purview to someone who agrees with Berlin’s view on austerity and budget discipline tells you everything you need to know about where economic policy is headed in the next half-decade. Georgieva is Bulgaria’s incumbent commissioner in Brussels, where she has won plaudits for her work with the international cooperation, humanitarian aid and crisis response portfolio, especially with respect to her work during the 2010 Haitian earthquake. She is so well-respected that she emerged as one of the dark-horse candidate to become the next high representative for foreign affairs. 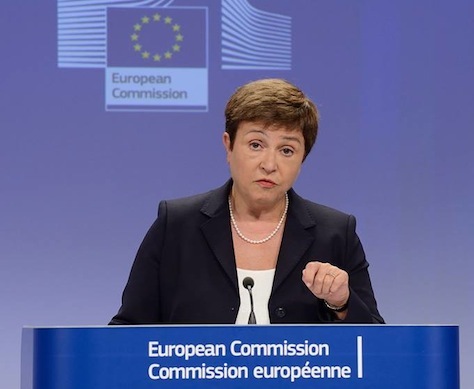 An economist by profession, Georgieva spent nearly two decades at the World Bank before joining the European Commission. That experience will undoubtedly come to good use in her new position as vice president for the budget and human resources, which combines elements of the current budget portfolio and inter-institutional affairs and administration portfolio. Though Georgieva technically belongs to the EPP, she’s among the most apolitical actors on the Commission. 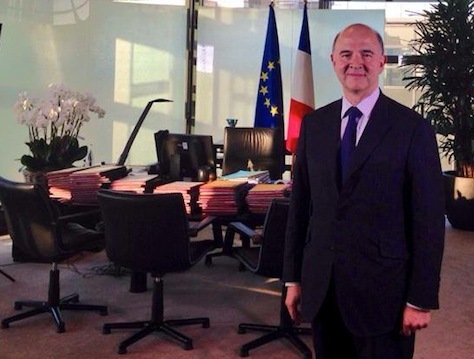 Moscovici comes to Brussels from Paris, where until the April 2014 cabinet reshuffle, he served as French president François Hollande’s finance minister. Though a member of France’s governing Parti socialiste (PS, Socialist Party), he’s a relatively moderate figure who pursued relatively orthodox economic policies, including unpopular budget cuts — to the dismay of the French left. Nevertheless, while he often challenged Merkel and other German officials to introduce more flexibility to EU budget deficit rules, Moscovici will now be in charge of enforcing those rules. His appointment as commissioner for economic and financial affairs came as something of a shock, because it was expected that one of the former prime ministers from eastern and central Europe might take the portfolio. It’s a reminder that, though it’s not as powerful as it once was vis-à-vis Germany, France still garners significant respect within the European Union. Unlike Rehn, Moscovici’s portfolio could be overshadowed by other officials — he’ll compete with another commissioner, Lord Hill, and two vice presidents, Dombrovskis and Katainen, to emerge as the Commission’s chief voice on economic policy. The Financial Times is already wondering aloud if Moscovici’s appointment is a Pyrrhic victory. Though Merkel can’t be thrilled about Moscovici’s designation, she will take much comfort that allies like Dombrovskis, Katainen and Ansip will also set economic policy as Commission vice presidents, and she’ll also take comfort in Timmermans’s surprisingly high-profile role. Merkel originally sent Oettinger, a member of her own Christlich Demokratische Union Deutschlands (CDU, Christian Democratic Party), to Brussels in 2010 after five years as the minister-president of Baden-Württemberg, ‘kicking him upstairs’ as a way to remove one more ambitious regional CDU leader from challenging her. Oettinger, whose initial grasp of English was weak, was originally viewed as among the Commission’s lightweights. In the last five years, Oettinger handled the energy portfolio, where he’s still working on issues related to the natural gas pipeline that runs to Europe from Russia through Ukraine, and where he tackled nuclear energy in the aftermath of Japan’s Fukushima meltdown. In his new role, he’ll work closely with Ansip on the digital economy, presumably working not only on copyright and net neutrality, but also on a new European data privacy directive in the aftermath of the US National Security Agency snooping scandal. Together with the incoming commissioner for competition law, Google and other technology companies have much to gain (or lose) during the Juncker Commission in light of the busy agenda for tech and digital policy. Though you might expect Germany, as the EU’s economic and political engine, to have a larger role on the Commission, the understated portfolio may ease concerns among other member-states that worry Berlin already calls too many shots in EU policymaking. Photo credit to EPA / Olivier Hoslet. 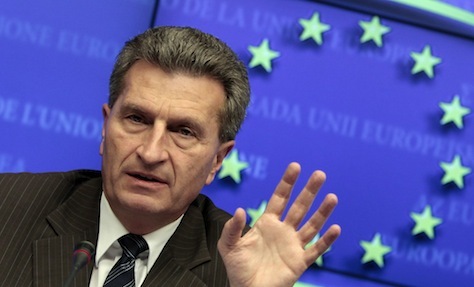 Like Oettinger and Georgieva, Hahn will be taking on his second consecutive portfolio as a European commissioner. Hahn, a Vienna -based leader in the center-right Österreichische Volkspartei (ÖVP, Austrian People’s Party), served as minister of science and research from 2007 to 2008 before his appointment as Austria’s commissioner in 2010, when he assumed the regional policy portfolio. His experience in regional policy may help him in his new role. Though Juncker has said that he expects no new member-states during the next Commission, negotiations will move forward with Serbia and Montenegro, which hope to complete the accession process within a decade. Albania and Macedonia are perhaps even more than a decade from accession, while Iceland and Turkey are backing away from EU membership. 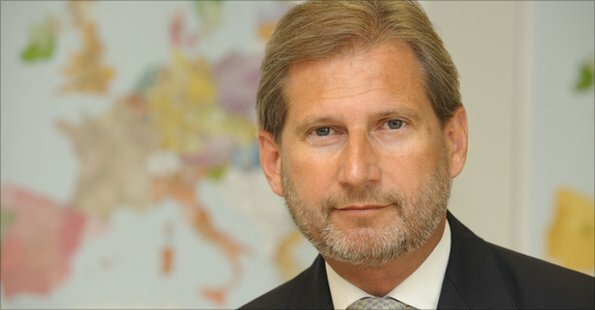 Hahn may also play a role with EU outreach to peripheral countries, such as Tunisia in North Africa, Armenia and Georgia in the South Caucasus and, of course, Ukraine. Otherwise, however, the enlargement portfolio will prove to be a rather sleepy post for the next five years. There’s one exception — if Scotland votes for independence in next week’s independence referendum, Hahn will take center-stage as European leaders and Juncker try to find a way to fast-track an independent Scotland into the European Union as seamlessly as possible. 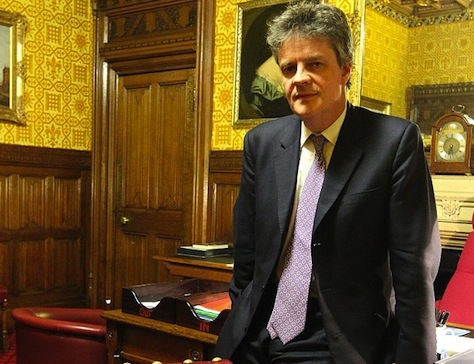 Lord Hill might be the most perplexing choice of any of the member-states. The Conservative leader of the House of Lords under prime minister David Cameron, a former aide to moderate Tories like Kenneth Clarke and John Major in the late 1980s and 1990s, and a former City consultant, Hill became a life peer in 2010. Cameron nominated him in July to the Commission after the British prime minister’s bruising (and isolating) fight to prevent Juncker from becoming the next Commission president. In so doing, Cameron ignored Juncker’s preference for a more female candidates and for high-profile candidates — Hill is neither. But Juncker may have been offering a olive branch to Cameron by offering Lord Hill the financial services portfolio, where he’ll serve as the chief EU regulator for London financiers. He will also play a key role in setting the terms of any further banking union within the European Union. With Cameron set to hold a referendum on British EU membership in 2017 if he wins reelection next May, Lord Hill’s solid portfolio may be designed to keep British officials engaged in one of the policy spheres they deem most crucial. If the European parliament pushes back against any of the proposed commissioners, however, Lord Hill could face the greatest scrutiny, with center-left and green MEP already comparing him to a ‘fox in a henhouse.’ (Another candidate who may face parliamentary skepticism is Miguel Arias Cañete, Spanish commissioner-designate for climate and energy change, who has made controversial comments about women and who has ties to the oil industry). Photo credit to Nigel Howard / Daily Mail. Of all the Commission portfolios, the competition brief has real teeth — the way that Italy’s Mario Monti shut down Jack Welch’s proposed General Electric-Honeywell merger in 2001 is the stuff of legends. Moreover, the outgoing commissioner, Spain’s Joaquín Almunia, this week reopened the Commission’s investigation into the US-based Google over its search and advertising business. The Almunia is also overseeing a delicate investigation into Russian gas giant Gazprom with respect to the way it supplies eastern European utilities. Both inquiries will still likely be ongoing when Denmark’s Vestager takes over the competition portfolio later this year. Vestager has served as deputy prime minister and minister of economic and interior affairs since 2011 in the government coalition led by Helle Thorning Schmidt, herself oft-mentioned for either the Commission or Council presidencies. 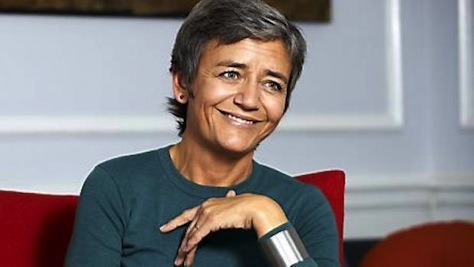 Vestager is herself a member of Det Radikale Venstre (Danish Social Liberal Party), the junior partner in the current government coalition with Denmark’s social democrats. 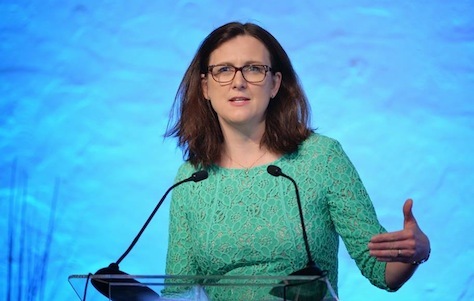 Another incumbent commissioner, currently for home affairs, Malmström will take one of the highest profile roles in the next Commission with the trade portfolio. That will make her the key contact in negotiating the Transatlantic Trade and Investment Partnership with the United States, which has the potential to become the most important global free-trade agreement since the World Trade Organization’s creation. Malmström is one the most experienced members of the Commission. A former MEP from 1999 to 2006, she served as Swedish prime minister Frederik Reinfeldt’s minister for European Union affairs before he named her to the Commission in 2010. She’s a member of the Folkpartiet liberalerna (Liberal People’s Party), one of the four center-right coalition parties struggling to win a third term in this weekend’s Swedish national elections. The outcome, however, won’t matter for Malmström, who could follow in the footsteps of former French trade commissioner Pascal Lamy, who went on to head the WTO, and British Lord Peter Mandelson, a top Labour official in the Blair-Brown era. If there’s anyone who personifies old-world southern Europe on this Commission, it’s Avramopoulos, a smooth operator who currently serves as defense minister in the beleaguered coalition government headed by Antonis Samaras. 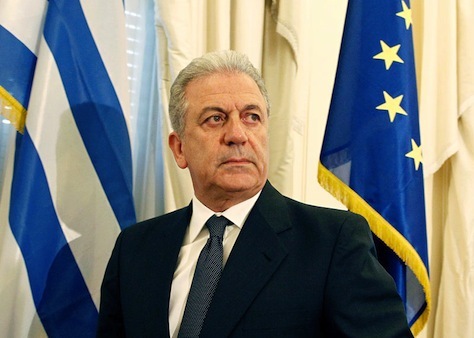 But Avramopoulos, a stalwart of Samaras’s center-right New Democracy (Νέα Δημοκρατία), has also served as foreign minister, as health minister and as tourism minister during the 2004 Summer Olympics. From 1995 to 2002, he served as the mayor of Athens. 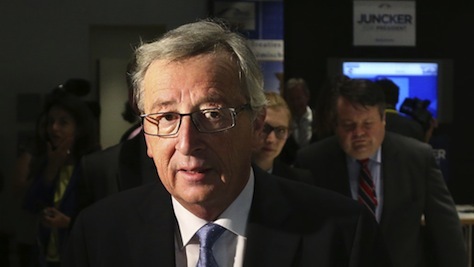 As a country on the outer edges of the European Union, Juncker put the onus on Greece to take more seriously illegal immigration into Europe by making Avramopoulos the chief regulator for immigration and defense. As an addition on Malmström, she has a reputation as a tough negotiator from her handling of the visa liberalization talks with the Balkan states, especially Kosovo. The combination of political liberal with a strong spine probably is what made her so appealing for the job.